luscious is a celebration of the play of color. Our image creation technique is a variation of the method we used in Flickr Flow and our Wired Anniversary image. luscious pays homage to fashion designers and photographers, those who compose rousing images of light and color that fill the pages of glossy magazines. The piece is our attempt to distill their visions into abstract compositions. To create the images in luscious, we began with a series of magazine advertisements for luxury brands. We then used a custom algorithm designed to extract �peak� colors from any picture (much like our Wired anniversary piece). 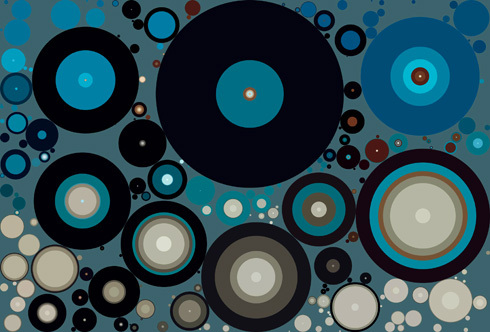 A random arrangement of concentric circles fills the plane, representing the essential colors of each region. The resulting image hides context and representation and lets the viewer concentrate on pure color. The two images below illustrate the process: at left the original, at right the transformed version. In the luscious gallery, we see Valentino dabbing a splash of his classic rosso, Armani presenting stark blues and blacks, and Bottega Veneta rejoicing in the warm tones of skin and leather. 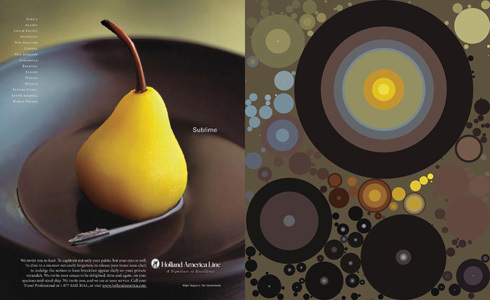 By abstracting away content, we can focus on the color play that sets the tone of these advertisements: the excited reds, the sober grays, and the occasional dash of yellow to brighten up the darkest blues.